Many myths (the ones about heroes and demigods, specifically) seem to have a grain of truth to them. One can imagine the legends of Hercules, Sigurd, Huang Di, and others like them as simple humans who did something relatively interesting that ended up with so many embellishments that they became demigods. It’s sort of like the big fish story you hear old fishermen tell. That fish gets bigger with every retelling. I’m sure Sigurd just killed a rogue crocodile or something. What was it doing in Scandinavia? Don’t ask me, it was probably a maverick. Personally, I don’t know that it matters that there is any truth to the myths we know and love or the religions we choose to follow. It’s easy to see the value in mythology and religions as ways to relate the world and explore our own psychology in ways that are comfortable and a little bit outside ourselves. The problem is that with modern myths/religions, people tend to take them too literally and push their particular values on others. In a globally connected world of people that are very very different from one another, that is pretty dangerous. As far as Sigurd goes, its one of my favourite stories in Norse Mythology. It has all of the elements of what makes Norse myths so marvelous and exciting. You’ve got this impossible feat, the slaying of a dragon with only moderate help from supernatural sources, and cold blooded murder. Sigurd is also a crafty sort of hero, digging a hole for himself to lie in while he waits for the dragon to pass over him so that he might stab it in the belly. Odin, in the form of an old man, warns him that if he doesn’t dig multiple holes, he will drown in the dragon’s blood. He succeeds in killing it and cooks the heart for the smith who crafted his sword, but in so doing he burns his finger and gets a bit of dragon blood in the wound. From then on, Sigurd can understand the speech of birds. The birds inform him that the blacksmith, Regin, is planning to kill him whereupon he finds the traitor and kills him first. Anyway, there are, of course, different versions of the tale. There’s also a lot more complexity to the one I’ve related above. You could do a lot worse than reading into some Norse myths. 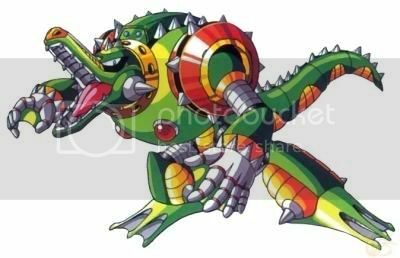 When you say maverick croc all I could think about was this. Love your comic! I’m a big fan of mythology and I find your art style refreshingly unique. My favorite, was the one where Loki ends up giving birth to Sleipnir, Odin’s horse. Haha that’s my favorite too! What? No “Bjorn Identity” pun? The problem with believing your religion is 100% true is a lot of things, but for one none of us are omniscient and can’t know anything is 100% true. For two, we’ll start pushing our ideas on others, but it’s madness for the world to agree on one version of one doctrine, and that ALWAYS causes war. Haha. Saying it’s spineless to have a little but of wonder and question in your beliefs reminds me of people who say that mercy and compassion are for weak people, when in fact it’s quite the opposite. I just love the look on the bear’s face. Sounds like a stellar read, may pick it up soon. I always wonder about the crafty heroes. The non-crafty ones seem to despise them so much. If I killed a dragon, I would tell people I beat it to death with my tremendous man fists. Build up my reputation as a fighter. But there are always these stories about heroes who won the day through cleverness and trickery, and that seems at odd with our ideas of these societies as having cultures where brawn is prized above brain. Odysseus (the ultimate crafty hero, I think) always wins, but no one ever likes him for it. And he’s always going out of his way to declare that he’s strong as well as clever. So who are these heroes admitting that they killed a dragon by coming up with sneaky plots instead of just chopping the head off? Makes me want to pull out my time machine and go back question people about mythology. And . . . is Bjorn eating porridge? I hope it’s just right. haha, great timing! and full of Norsology! Thor sounds like Hagrid in my mind.